This suspension bridge was an important transport link in what was a relatively remote part of Southland. It was officially opened by Sir Joseph Ward on 5 April 1899. It was designed by C H Howarth and the total cost was £5007. The bridge was built in 1898-99 to span the Waiau River and replaced a punt which had operated since the early days of settlement. At that time the river was often swift and dangerous (the flow has now been severely reduced by hydroelectric development on Lake Manapouri). The bridge was an important transport link and was influential in the opening up of the area east of the Waiau River. A single lane bridge, it was originally used by horse and cart traffic and later by vehicles. It remained in operation until 1978 when a new bridge was built 130 m downstream to cater for traffic to and from the Manapouri power project. This is a fine example of a suspension bridge. This bridge represents a high standard of design and bridge carpentry. Although modest by international standards it was designed after the development of drawn wire construction for suspension bridges and new materials such as steel. The building of a bridge of this span was a significant local engineering feat made possible by the tensile properties of the steel cable. 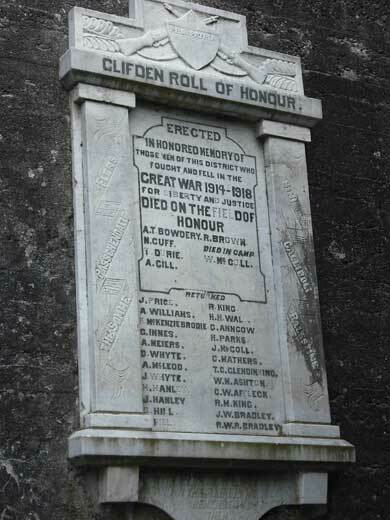 A feature of the bridge is the Clifden Roll of Honour, a plaque commemorating those men from the district who gave their lives in WW1. The plaque is attached to the north tower at the eastern end of the bridge. Clifden Suspension Bridge is located on SH99, 16 km north of Tuatapere.